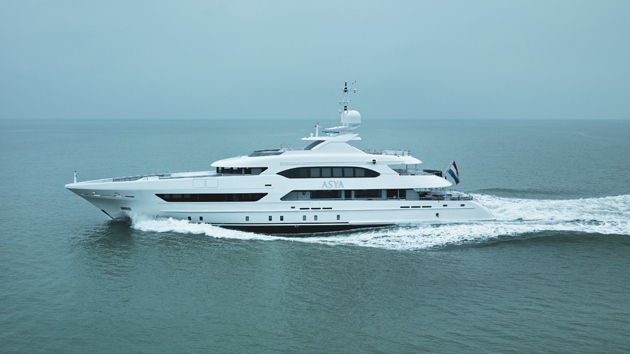 Heesen yesterday handed over the 47-metre displacement superyacht Asya to her owners. The yacht, which hit the water in December, is the second in the restyled 47-metre class with exterior styling by Frank Laupman of Omega Architects. The restyling includes an improvement in the housing of the rescue tender in an enclosed bay in front of the wheelhouse, and crew accommodation that complies with LY3 regulations. Asya’s interior is by Bannenberg & Rowell and has, the yard says, “a distinctly Far Eastern, restful feel”, that has been inspired by the work of some pillars of 20th-Century design – industrial designer Dieter Rams, and architects Frank Lloyd-Wright and Tadao Ando. Powered by twin MTU M63 diesels, Asya’s steel hull with bulbous bow exceeded the contractual speed by 0.8 knots on sea trials, carried out in the North Sea in February. At her cruising speed of 12 knots she has a range of 4,000 nautical miles.